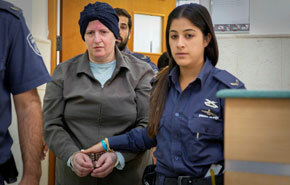 ​​The bail plea for the accused sexual abuser Malka Leifer has been denied in Jerusalem and the former principal Adass Israel school in Melbourne will remain in prison…a video report. ​Child sexual abuse advocate Manny Waks told TPS. One of Leifer’s victims Nicole Meyer spoke to Waks by video on behalf of herself and her two sisters. Leifer is wanted by the Victorian police in Melbourne where she faces 74 charges on child sexual abuse committed between 2003 and 2008. Leifer fled to Israel. She was arrested in 2014 and her lawyers have consistently claimed she is unfit mentally to face a court dealing with the request for her extradition. Israel’s Deputy Health Minister Yaakov Litzman is being questioned by police on the ground he exerted pressure for Leifer getting psychiatric reports claiming she is unfit to face court. Malka Leifer did not appear in court. The next hearing concerning her extradition will be on March 6. “We are also deeply troubled by grave allegations that Deputy Health Minister Yaakov Litzman met with Jerusalem’s district psychiatrist (Dr Jacob Charnes) to pressure him into issuing a false assessment for Leifer in support of her claim that she should not be extradited to Australia because she is unfit to stand trial due to her mental state”, Mr Block said. “We understand Israel’s anti-corruption unit is now conducting an investigation into the conduct of the Deputy Health Minister. He should stand down from his position while the investigation is underway. If it is found that there is any truth to the allegations, the Deputy Minister should be prosecuted for interfering in the administration of justice.”Mr Block also stated that in light of the allegations about the conduct of the Deputy Health Minister, “it is understandable that the court also ruled that another psychiatric assessment must be undertaken to test Leifer’s claim that she is mentally unfit”. “Representatives of the ECAJ met on Monday with the Australian Ambassador to Israel and again conveyed our view that the extradition of Leifer to face justice without delay is a matter of the highest concern for the Australian Jewish community. We are grateful to the Ambassador and to the Australian Government for the assistance being offered to child sexual abuse survivors.